You will be given a Free reference e-book to read which has 987 pages And the test will be based on that e-book. CCNA which stands for Cisco Certified Network Associate refers to a first-level career certification which is mainly based on Cisco. Receiving this certification proves that you really have the ability to configure, troubleshoot, operate and install switched and routed networks of medium sizes. It also shows your effectiveness in verifying and implementing connections to remote sites that are part of a wide area network (WAN). You can also expect this certification to work in maximizing your knowledge about foundational networking and boost the value of the network of your employer. Becoming certified in this field requires you to undergo an educational training and a certification exam. You will need to get a passing score which is mainly set with the help of statistical analysis. This certification exam aims to test your skills and knowledge in installing, operating and troubleshooting medium-sized networks. It also covers topics linked to network security implementation, different types of network, fundamentals of switching and routing, WAN technologies, IP addressing, determining IP routes and using access lists to easily manage IP traffic. 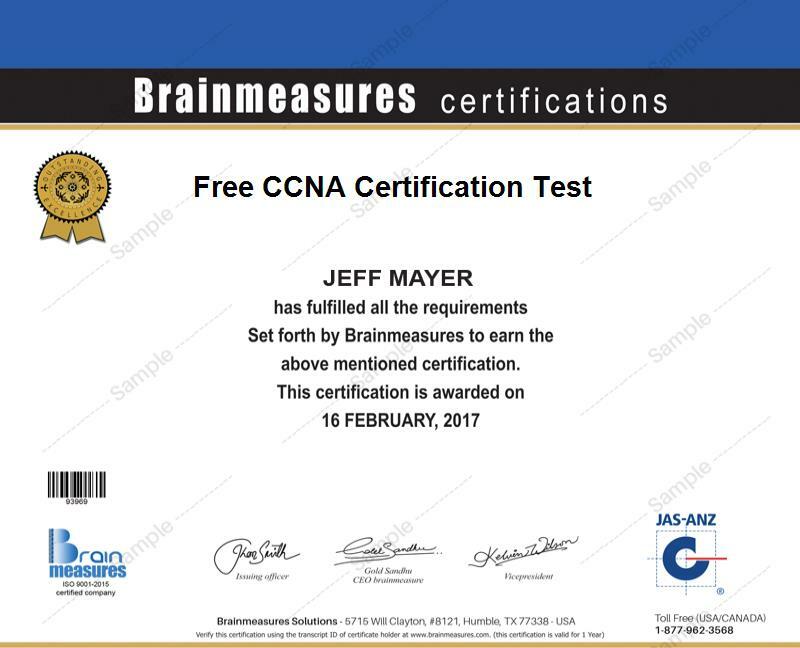 Fortunately, a free CCNA practice course is now available at Brainmeasures which can help you handle all the challenges and complexities involved when trying to get your CCNA certification. This free certification course lets you access a free study guide consisting of the most updated and accurate information and a free practice test which can help prepare you on the things that you may encounter upon taking up the actual certification exam. The existence of a free CCNA practice course available at Brainmeasures is proven to be really amazing because it gives you the chance to maximize the level of your understanding about what CCNA is and the major functions that you will need to play once you become one. The practice course can significantly enhance your skills and ability to pass the actual CCNA certification exam since it also offers a free study guide which comprehensively talks about CCNA and the different things that one can do to effectively deal with all their responsibilities and roles in this field. You also have greater chances of receiving a certificate as a CCNA because it comes with a free practice test which is a huge help in providing you with a clearer idea about what you can expect from the actual certification exam. With this, the possibility of becoming certified in the field is higher. Because of the effectiveness of the free CCNA practice course offered by Brainmeasures in preparing you towards efficiently handling the actual CCNA certification exam, it would continue to provide numerous benefits to all aspiring CCNAs. It is proven to be more beneficial to all network support engineers, administrators and specialists who plan to further boost their career in the networking industry by receiving a CCNA certification. Upon receiving your CCNA certification, you can also start enjoying a better salary. This is a major help when attempting to grab the position of a certified networking associate and earn an average annual salary of $83,000. Using your certificate to work as a network support engineer is also financially rewarding because it entitles you to enjoy around $65,000 to $112,000 per year.